Gyokusendo Cave, from my 2 previous posts, was highly mentioned as a travel suggestion during our orientation here in Okinawa. 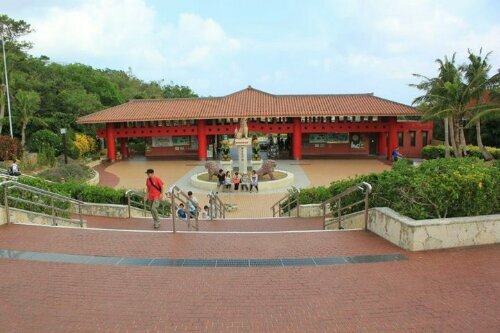 It says that it is in Okinawa World. Given I don’t fully research about the places I go to, I really wondered so much as why they call it “Okinawa World”, and why in the Okinawa World the cave is doing there. Luckily Okinawa World is not a theme park as I thought it sounded to be, neither a news channel. 😀 Little did I know (I’m too slow to catch it.) that Okinawa World encompasses most of what you need to know about Okinawa living. That being said, in well under a month, i got me a pretty good gist of what it’s like here in this little piece of Japanese land. No book nor Powerpoint presentation can offer that kind of knowledge in one presence than being in Okinawa World. Above: Old houses, hanging wishes, food that day, open-mouth Shisa and Habu snake. They also have a glass blowing and shisa making tutorials. We each made our glass purchases. 🙂 We all also tried wearing Kimonos which was so cool. We also wrapped wrapped ourselves to a very large snake. Like I previously said, it was a bucketlist galore when we were there in Okinawa World. We also tried Habushu or Habu Sake or snake wine. They also have Eisa performance, but photography was not allowed. You can visit my previous post here. They said a swig of this snake liquor can easily knock you out, an instant sleeping pill. 🙂 A bite from the snake can actually lead to many side effects including death as Habu snakes are venomous. My most favorite Japan blog? Cocomino!!! Cocomino’s blog is awesome. It’s your one-stop blog of all things Japanese. He got travel locations, museums, parks, family fun and games, activities like making sponges and chopsticks, what-have-they’s. One thing you need to know is that English is a second language to him, but you’ll be so amazed on how he picks up on it. I love this blog. If you want to see Japan, you gotta see Cocomino’s blog Life in Kawagoe. Glad to do so. Japan has a very very distinctive culture that it’s easy to get interested to it. I appreciate you taking time to introducing us Japanese life and culture. Thank you, Rommel! This is so cool! I hope to visit Okinawa one day. My husband,when enlisted in the Marines, got stationed there for several years. He loved it! I can see why now. The traditions are fascinating. I hope all these here give him back some memories. What an adventure, I’m not sure about that food though, was it good? The first food pic in the gallery was good. The snake wine, uhm, is really more like a liquor. Plenty of Americans in the service here. I like interacting with them. 😉 Yeah, most of them are not as interested. I don’t get that, really. So many people pay good bucks and go extra length to be n foreign land. A lot of military personnel just don’t travel and go places at all. 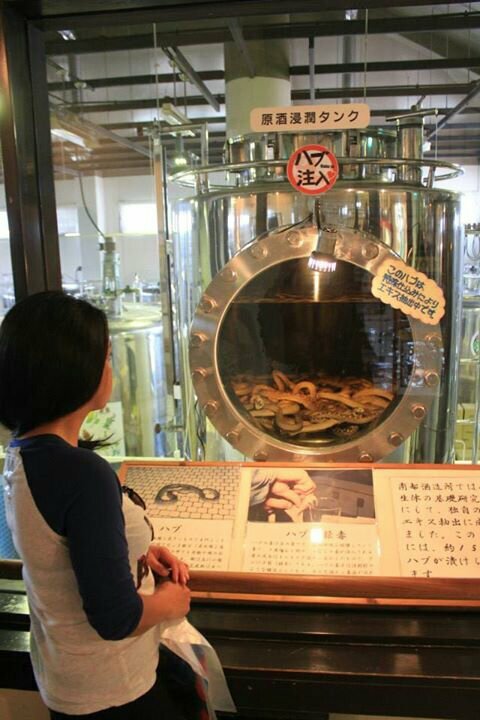 it’s hard to think about snake liquor – you mean they actually drink, wait. what exactly do they swig from this snake? the poisonous juices or liquid from another part of the snake? The liquid is the alcohol which you drink. They just put the snake in the bottle. I guess it mixes with the snake as well. The snake you don’t eat because it’s venomous. Have a wonderful Okinawa life. I’ve been so impressed with your blog for a long time, Cocomino. I finally get to feature you. It was a long time coming. Eat lots of Okinawan food while there, Rommel. They’re the longest lived people in the world, thanks to their diet. Thanks for such an informative and fun post. 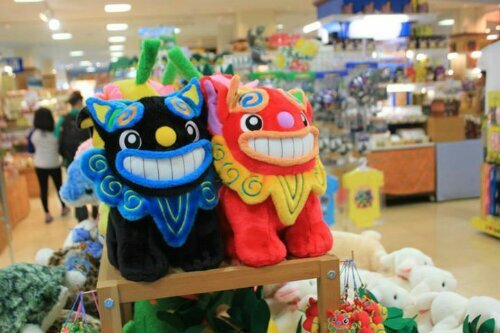 I would really love a pet Shisa. So ugly cute. 😀 Looks like you’re really having fun there, Rommel. You would be so interested to a bunch of things here. I have not been to Japan for 30 years. Sendi was the the farthest north that I travelled. 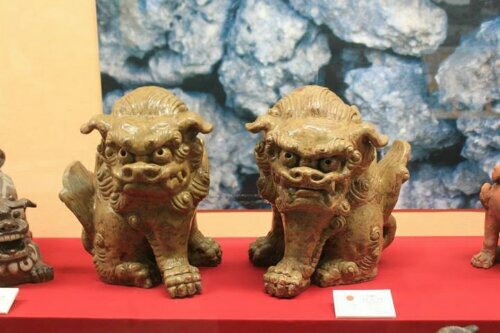 Regarding those Shisa dog-lions, I had not thought of it before, but it looks a lot like a caricature of an Akita dog. Akitas are similar to huskies, but were bread in northern Japan to hunt bears. We have an Akita mixed with ???. Being an alpha-dog type, she guards our front porch, sitting with her tail curled up, stalky shoulders tall, ears up, and ready to snarl at intruders. Hmmm. Just speculation. Enjoy your travels. Shisa; finaly I get to know what they are. Thank you, Rommel. oh my goodness – i used to live in Okinawa, and Gyokusendo Cave used to be one of my favorite places to go. Thanks for the photography – really brought back some memories. Yeah. Okinawa brought me to a cave, a big one off my bucket list. So grateful for that. If you happened to see any wrong info about Okinawa that I shared or will share, I would appreciate the help. The modern shisas are a lot more friendly looking than yesteryear’s fierce ones. Gosh, I am learning so much about Japan from your posts! I could do without the snakes, though! I don’t even want to look at them. Just being within this culture has got to make everything sink in faster for you to learn things. Being Asian, it still amazing how, we, asian countries all still have different cultures and traditions within the Asian races. I recognize the blessing of having this opportunity to experience a different culture than my own. I am not shy to say hi, so “hi”. It’s been a while, Rom. You still do that featuring blog kind of thing. Happy to know. It’s like a bit of a peer coaching in the academe. Anyway, I wish I have a job like you. It gets you to so many places. How cool is that, huh? Somehow, your vivid pictures get me to Japan. I wish one day I could get to so many places too. But you do, Sony! The post you had driving around on a sandy desert, I thought, wow this guy is lucky to have experienced that.